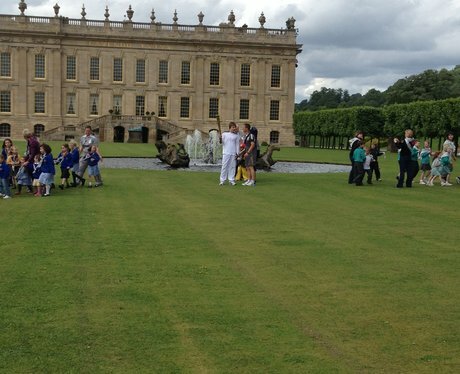 See the best of the pictures as the Olympic Torch makes its way from Nottingham to Derby. Torchbearer 001 Barbara Green carries the Olympic Flame outside Nottingham Castle gates, on the Torch Relay leg through Nottingham. Dino and Pete down in Matlock ahead of the torches arrival. Torchbearer 001 Barbara Green poses with the Robin Hood statue before she carries the Olympic Flame on the Torch Relay leg through Nottingham. Hit-and-run survivor and former Miss Nottingham entrant, Torchbearer 006 Chloe Jones and chaperone (no name available) carries the Olympic Flame on the Torch Relay leg through Nottingham. Torchbearer 002 Adam Guest carries the Olympic Flame on the Torch Relay leg through Nottingham. Torchbearer 010 Rebecca Lowther carries the Olympic Flame on the Torch Relay leg through Nottingham. Jayne Torvill and Christopher Dean carry The Olympic Flame as it makes its way through Nottingham city centre. Torchbearer 030 Adam Crump poses with the Olympic Flame at Newstead Abbey in Nottinghamshire, on the Torch Relay leg between Glapwell and Bolsover. Schoolchildren wait by the side of the road for the Olympic Flame on the Torch Relay leg between Glapwell and Bolsover. Torchbearer 036 Jon Kirkham runs through tickertape as he carries the Olympic Flame on the Torch Relay leg between Glapwell and Bolsover. Torchbearer 040 Hollie Ross carries the Olympic Flame on the Torch Relay leg between Calow and Chesterfield. Torchbearer 009 Sophie Chatel carries the Olympic Flame on the Torch Relay leg through Nottingham. Torchbearer 035 Matt Greenwood carries the Olympic Flame on the Torch Relay leg between Glapwell and Bolsover. Torchbearer 048 Olivia Ford carries the Olympic Flame on the Torch Relay leg between Calow and Chesterfield. Crowds eagerly await Torchbearer 055 Malcolm Morley as he carries the Olympic Flame on the Torch Relay leg between Calow and Chesterfield. Torchbearer 054 Joel Knight carries the Olympic Flame on the Torch Relay leg between Calow and Chesterfield. Torchbearer 046 Grant Barker carries the Olympic Flame on the Torch Relay leg between Calow and Chesterfield. Torchbearer 059 Dominick Cunningham carries the Olympic Flame on the Torch Relay leg through Matlock. Torchbearer 055 Malcolm Morley carries the Olympic Flame on the Torch Relay leg between Calow and Chesterfield.